The season so far has been a tale of two regions, where the Mid-Atlantic and central-northern New England have been bearing the brunt of winter while those in between are lagging behind. Despite trouble in the snowfall department, there was much cold air to spare for everyone by the second half of January. High pressure started the month off on a quiet and relatively warm note. Of course, “warm” in this case being in the 40s, although the beginning of the week did reach into the 50s. By the 2nd and 3rd, a failed system split itself and skipped over much of the region between Washington, D.C. and New York City. While the southern piece gave a bit of rain in Virginia, the northern piece was cold enough to result in a wintry mix of coatings to 1” of snow and sleet in interior Massachusetts and southern New Hampshire. Late in the day on the 7th, a warm front resulted in a brief shot of snow and sleet that caused light accumulations stretching from northern Maryland into New York. This was an appetizer so to speak before the main system arrived the next day. However, even this remained under 0.5” for much of the region north of the Mason-Dixon Line (a few higher elevations received at least a few inches). The following cold front brought a northwesterly flow for the next three days. As a result, downwind flurries and snow showers from the Great Lakes broke out across the Northeast, mainly on the 9th and 10th. After a shift in the pattern, yet another storm affected the Mid-Atlantic on the 12th and 13th, which brought significant snows to Virginia, Maryland, and Delaware. A general 4 to 8 inches of snow fell, with up to 10 to 12 inches in and around Washington, D.C. Even parts of southeastern Pennsylvania and southern New Jersey received a few inches (some light snow flew briefly as far north as northern NJ). This contributed to a gap between New England and Maryland that lacked snowfall. After another quick moving system on the 17th-18th, a vigorous disturbance skirted through on the 19th and 20th. 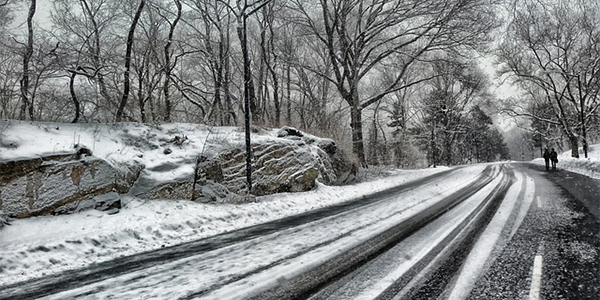 Front-end snow mixed with sleet left 4 to 8 inches across the Hudson Valley, Connecticut, and most of Massachusetts. This changed to rain and freezing rain, which actually left several tenths of ice accretion in some spots, especially in central Connecticut where not only several inches of mostly sleet fell, but it also left crippling amounts of ice. To make matters worse, rapidly falling temperatures also resulted in a widespread freeze-up afterwards. High pressure and 10 to 20 degree temperature departures below normal would dominate the interim. While not record-breaking for some, cities like Hartford, CT actually fell below freezing early on the 21st. Ahead of one of the few mainly rain storms at this point, warmth quickly rebounded as a surge of moisture resulted in 1 to 2 inches of rainfall across the Northeast on the 23rd and 24th. One last system on the 29th then led to another 4 to 8 inches of snow across interior Pennsylvania through Massachusetts (including up to a foot in parts of the Hudson Valley!) but a warm front to the south resulted in a sharp cutoff in accumulations just north and west of the I-95 corridor. As was the case before, yet another freeze-up followed as temperatures dropped well below freezing behind the system. A powerful Arctic front then swept across the region the next day and left snow squalls in its wake. These squalls only lasted up to a half hour for most, but it came down heavily, resulting in up to an inch of snowfall and near whiteout conditions. Brutally cold air would quickly follow that sent temperatures well into teens and single digits by nightfall, and even well below 0 for interior locations. Philadelphia, PA broke a record low on the 30th at 7 degrees, while Baltimore, MD had one of its coolest high temperatures on record at just 21 degrees during the day on the 31st! Because of the wild temperature swings, January landed around average within 2 degrees. In terms of snowfall though, the season has varied wildly from south to north. As of the 31st, Boston (at least officially at the airport) still lags well behind what is normal at this rate with just over 2” of snowfall against a 23” normal. In fact, many cities south to Philadelphia, PA are several inches behind, while Washington, DC and Baltimore, MD are either ahead or just near their normal, respectively; Washington in particular has already received 13” so far! Luckily, there is still room to improve those numbers as we move through February and eventually early March.